Hey happy almost Wednesday. How’s everyone doing? Did Winter Storm Jonas hit your area with a lot of snow? We got a lot of snow here in Manhattan. I’ve enjoyed walking in the snow and have been impressed by people’s athleticism-there was a lot of sledding and my boyfriend ran ~5 miles in the snow! Central Park looks particularly majestic. These have joined my whole wheat banana chocolate chip muffins as a top 2 muffin recipe. To be honest, I knew I’d love them before I even tasted them. I’d bookmarked this recipe months ago, and finally tried them on Sunday morning. It appears that I’m on a carrot-plump raisin kick, with no signs of stopping! These muffins feature the same winning combo as the carrot cake from last week. 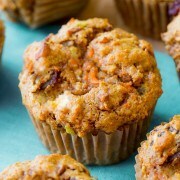 These hearty and simple morning glory muffins taste like spiced apple cake and moist carrot cake… combined… for breakfast! Preheat oven to 425°F (218°C)7. Spray a 12-count muffin pan with nonstick spray or use greased/sprayed cupcake liners. This recipe makes 16 muffins, so prepare a second muffin pan in the same manner. In a large bowl, whisk the flour, baking soda, cinnamon, ginger, salt, flax, and pecans together until combined. Set aside. In a medium bowl, whisk the eggs, brown sugar, honey, oil, applesauce, orange zest, orange juice, and vanilla together until combined. Pour the wet ingredients into the dry ingredients, stir a few times, then add the raisins, carrots, and apple. Fold everything together gently just until combined and no flour pockets remain. Make ahead tip: Muffins stay soft, fresh, and moist at room temperature for up to 5 days. Muffins freeze well for up to 2 months. Thaw overnight in the refrigerator and heat up (if desired) before enjoying. 2 cups of white whole wheat, whole wheat pastry flour, or all-purpose flour work too. Instead of pecans or walnuts, you can also try sunflower seeds. Or leave out completely. If using the nuts, feel free to toast them for 10 minutes at 300°F (148°C). Instead of honey, you can try agave or maple syrup instead. Or use 1/4 cup more brown sugar. Instead of applesauce, use an extra 1/3 cup of oil. 1/3 cup mashed banana works instead too, but I found the muffins to be a little dry. I used a mix of golden raisins and regular. Instead, try dried cranberries or leave them out completely. Any variety apple works! I use Granny Smith. Why the initial high temperature? The hot burst of air will spring up the top of the muffin quickly, then the inside of the muffin can bake for the remainder of the time. This helps the muffins rise nice and tall. I’ve been converted. I used to shy away from baking carrot cake. It seemed labor intensive and also tricky to make it just right. How did I end up baking this beauty, you may ask? I was commissioned volunteered to bake for my sister’s birthday last week, and she requested a carrot cake. I was so glad that I had bookmarked this recipe. I had known about the James Beard-winning chef Dorie Greenspan and was confident that her cake recipe would be fantastic.This cake did not let me down. The cake is a stunner. The frosting alone is something to write home about.It’s a standard-issue cream cheese frosting with a one-to-one ratio of cream cheese to butter which is ideal, so that the frosting tastes like cream cheese but not straight cream cheese. The recipe calls for lemon juice instead of the usual vanilla extract-I was hesitant but couldn’t taste the difference. And the cake itself is luscious and rich with a great flavor-I love the bits of raisins and the overlay of coconut-both are a great complement to the carrot. The cake is pretty easy to make too. I had asked my boyfriend/sous chef to grate the carrots and even bought him a bagel with lox to power him through the grating, but he was sleeping when I wanted to prepare the cake, so I grated the carrots myself. Easy peasy. It’s best to use the fattest whole carrots that you can find. To plump up the raisins, you can cover them in boiling water and let steep for 10-15 minutes before draining. I omitted the nuts to suit the birthday lady’s taste. Greenspan calls for baking this cake in three layers, but I read reviews and since the three layers are thin, I decided to bake it in two layers. For the cake: Preheat the oven to 325 degrees. Grease two 9-inch round, 2-inch deep cake pans (I used cooking spray) and line with parchment paper. Whisk together the flour, cinnamon, baking powder, baking soda and salt and set aside. In another bowl, stir together the carrots, chopped nuts (if using), coconut and raisins. Working in a mixer fitted with the paddle attachment, or in a large bowl with a whisk, beat the sugar and oil together until smooth. Add the eggs one by one and continue to beat until the batter is even smoother. If you are working in a mixer, reduce the speed to low, if you’re working by hand switch to a large rubber spatula, and gently stir in the flour mixture — mix only until the dry ingredients disappear. Just as gently, stir in the chunky ingredients. If you’d like to have coconut in the filling, scoop out about 1/2 of the frosting and stir the coconut into this portion. To frost the cake, place one layer of the cake, right-side up, on a cardboard round or a cake plate. If you’ve added coconut to the frosting, use half of coconut frosting to generously cover the first layer. Use an offset spatula or a spoon to smooth the frosting all the way to the edges of the layer. Top with the second layer and use the plain frosting to cover the top and the sides of the cake. Finish the top layer with swirls of frosting. If you want to top the cake with toasted nuts or coconut, sprinkle on these ingredients now, while the frosting is soft. Slide the cake into the refrigerator for 15 minutes, just to set the frosting. Serving: The cake can be served as soon as the frosting is set. It can also wait, at room temperature and covered with a cake keeper, overnight. The cake is best served in thick slices at room temperature and, while it’s good plain, it’s better with whipped cream, vanilla ice cream or even some lemon curd with a little whipped cream folded in. On a fateful day in high school, I found the recipe on the Domino Sugar bag. I’ve found some of my favorite recipes on the packaging for baking ingredients. And most of the time, you can easily substitute another brand of the ingredient without an issue. I normally substitute non-fat yogurt for the sour cream in this coffee cake, but I recently found that this rendered the cake a bit dry. So when I made it for a New Year’s brunch, I used the sour cream as the recipe calls for. We could all taste the difference. My mom, who has enjoyed this cake for years, declared it so good that I could be a caterer. Thus, I don’t recommend substituting a lower fat alternative for the sour cream. Preheat oven to 350°F. Grease 10-inch tube pan. In small bowl, combine topping ingredients; set aside. Beat butter and sugar in large bowl until light and fluffy. Beat in eggs, sour cream and vanilla until well mixed. Combine flour, baking powder, baking soda and salt in bowl. On low speed, add flour mixture to batter, beating until smooth. Spoon 1/3 (about 2 cups) of the batter into prepared pan, spreading evenly. Sprinkle with 1/3 of the topping (scant 1 cup). Repeat layering 2 more times. Bake 55 to 65 minutes or until a wooden pick inserted in center comes out clean. Cool in pan on wire rack for 20 minutes. Remove from pan. Hi everyone and welcome to Baking with D.
My name is Deena and I am a twenty-something New Yorker living in Manhattan. I work in financial services and spend a lot of my free time shopping at some of my favorite stores (Fairway, Whole Foods) with my boyfriend, baking, and exploring New York. I admire many food blogs for their gorgeous photos and delicious recipes, so I'm excited to start my own.